Porcelain has been used for centuries for different purposes, such as for fine cutlery or decorative elements, but nowadays it is often used for flooring, kitchen and bathroom work surfaces…Varieties in which you can use porcelain for your commercial facilities are numerous, and the most important is that it will also bring numerous advantages. So, let’s take a look at the advantages of porcelain slabs for commercial spaces. No material is 100% stain-resistant, but porcelain is very close to it. The non-porous surface of it prevents liquids from absorbing and leaving a stain. Quartz and granite are most often referred to as the ‘most durable countertops’ but we shouldn’t forget about the strength and quality of porcelain slabs too. Although porcelain has been known for centuries, it recently became very popular for kitchen and bathroom countertops. Porcelain is a type of ceramic tile, made of fine and dense clay and it is produced on very high temperatures. That makes porcelain tiles tough, scratch and stain resistant. Porcelain tiles can be used anywhere you want a good looking surface with excellent performances. The most often use is for flooring, but it can be also used as shower and bathroom walls, even kitchen countertops. Porcelain floor tiles require very low maintenance; the porcelain surface absorbs very little moisture, which prevents the spills from penetrating into the material and staining. Porcelain can have a polished or matte finish. There are no differences in the cleaning process of both finishes. Continue reading to find out about the best tips to clean porcelain floor tiles. When a homeowner makes the decision to renovate their home, one of the toughest decisions is deciding on the material you would prefer and would suit your home. There are many materials out there that have a very similar list of pros and cons, which make it often harder to make the decision. Whether you are making the decision based on how durable the surface is or what is available to you in terms of colours and finishes or how easy the surface is to maintain, everyone has their personal lists to tick off that are important to them. We will cover two of the most popular surfaces on the market at the moment; Quartz and Porcelain slabs, to see discuss the good and bad points of both. Porcelain is one of the only surfaces out there that comes with a lengthy list of advantages and not many downfalls at all, which is superb for homeowners. Porcelain comes in a huge range of colours, patterns and finishes to suit absolutely every type of style. Regardless of which colour you are looking for, you are sure to find the perfect one for you and your individual style. One of the great benefits to Porcelain is that it is able to be made to look a lot like natural stones such as marble in terms of veining, which is a huge plus for homeowners. If the natural appearance is something that you are looking to achieve, the Porcelain may be ideal for you. When it comes to creating surfaces such as kitchen islands, Porcelain is absolutely perfect as it is available in large slab sizes. There is often no need to fuse together multiple slabs, which makes it perfect for that seamless look. Porcelain is also perfect for being installed in direct sunlight as it will never fade while in the sun, meaning that you can place it whether you wish without worry. One of the most important things to consider with any material is how stain resistant it is. If you spill food, make up or anything that is likely to stain, Porcelain is one of your best bets. As well as being scratch resistant, you will never worry about spilling or skimming the surface with any product or item. However, Porcelain does not come without its cons either. Porcelain can chip, crack and damage over its lifetime if you are not careful. The risk the damage may be small and much less than when compared to natural stones, there is still a risk that is high enough to worry about. Quartz stone is one of the best contenders when thinking about which material to use within your home. Quartz is very well known for being low maintenance and it is a dream for homeowners. Unlike natural stones, Quartz will never need to be sealed or treated regularly making it easy to maintain and remaining cost effective. Quartz is also a non-porous material which means that cleaning is made so much easier. Just like Porcelain, Quartz is great when it comes to being stain resistant too. You will never have to worry about spillages or dropping food that could potentially stain, as it will simply remain on the surface to be cleaned away. Quartz is also one of the best budget friendly options out there on the market too. Not only is the cost lower for the initial purchase, but it is also cheaper long-term as there are no commitments to treatments. The zero maintenance makes it so worth while. Lastly, Quartz is also durable and hard wearing which makes it great for being work surfaces and flooring in high traffic areas. As long as you take proper care of Quartz, it will last many years. Porcelain slabs have been growing in popularity in the recent years, because it comes with its own long list of advantages. However, as with everything, porcelain is not without its downfalls either. We will discuss why Porcelain is a great choice for any home while highlighting some of the cons of Porcelain too. Hopefully, this overview will give you all the information you need to decide whether Porcelain is for you. Porcelain comes readily available in a big range of colours, finishes and patterns to suit many different personalities and styles. The varied pigmentation of Porcelain’s raw materials is what creates the selection of colours that you have to choose from. When it comes to the finishes, the pigmentation is what gives the Porcelain the look of natural stone that may contain veining. Furthermore, the appearance that you are able to achieve with Porcelain will never fade over the years. Porcelain slabs are UV resistant which simply means that wherever you install your Porcelain slabs, the sunlight will never make a difference or fade your surface over time. Porcelain is also perfect for being placed within the kitchen areas or anywhere around the home where harsh chemicals and food are likely to be used often. Porcelain offers you a stain resistant surface and ease of mind in terms of being simple to keep clean. 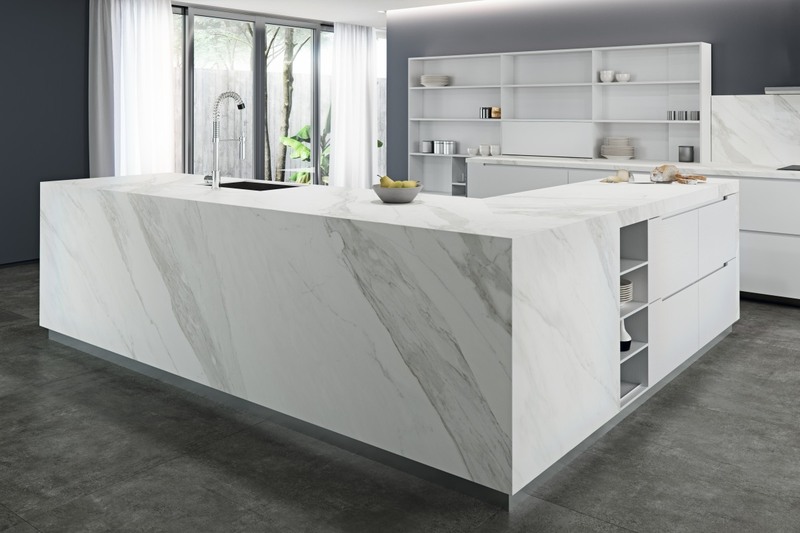 Additionally, Porcelain is also scratch resistant which is great for kitchen areas where there is likely to be sharp and heavy objects used daily such as knives and scissors. Porcelain slabs are also available in larger sizes too, unlike many other materials out there on the market. 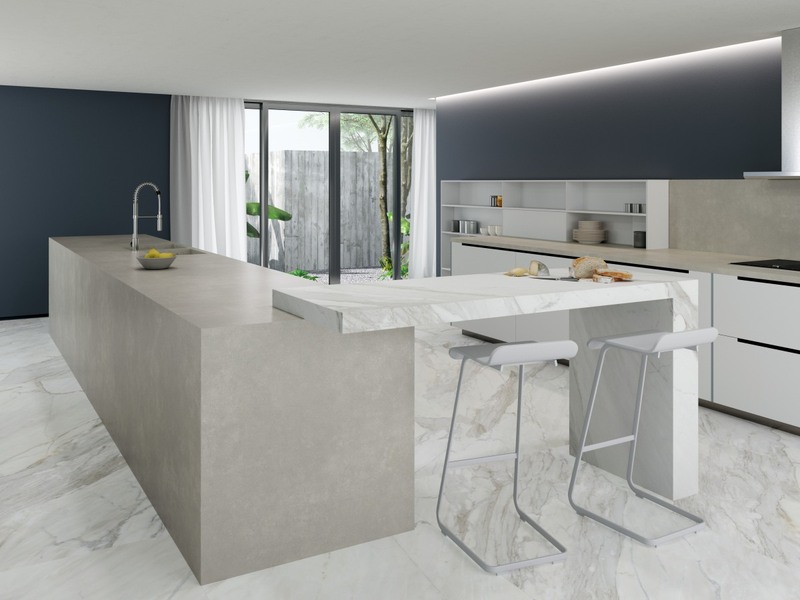 Porcelain gives you complete flexibility as you are able to purchase just one single slab for your kitchen where possible, so it removes the need for fusing multiple slabs together. Lastly, Porcelain is perfect when it comes to being handled which is a huge bonus for both the homeowner and manufacturer. Porcelain is great for being installed as it can be cut and handled with ease, which makes for a quick and easy process. However, Porcelain is not without some cons either. Porcelain can be chipped and cracked, despite how durable the surface is so you cannot rely on Porcelain being indestructible. However, it will take much more force to damage Porcelain than any natural stone surface out there. Quartz Marble effect is one of the most sought-after materials when it comes to home renovating. If you want a stunning, timeless beauty then Marble effect stone can be one of your best options. Calacatta marble effect is one of the most popular slabs within the Marble range category for homes. But why spend out for the real deal when there is Calacata Porcelain slabs on the market? When you are looking into which Calacata Porcelain slab you would like within your home, the finishing you include can drastically improve and change the overall appearance. You are able to choose from both matte and polished finishes, depending on your style and taste. When it comes to sizing up your house, regardless of how big or small you may need the Calacata Porcelain slabs to be, the chances are there will be the perfect size available to order. Calacata Porcelain slabs have many uses so there is no reason why you should be limited with what you want to use it for. Giving you so much freedom for your home renovating, Calacata Porcelain can be used in a wide range of places including bathroom walls, work surfaces, shower walls, flooring and so much more. But what makes Calacata so popular in the first place? Calacata comes with a unique blend of grey, white and golds that are flowing throughout the veining. This particular slab offers nothing less than elegant beauty that will last a lifetime. Porcelain may not be the cheapest material on Earth, it is cheaper than other stone types. For those who are wanting a beautiful stone to use around their home but cannot afford the price tag that is attached to Calacata Marble, this is just what you are looking for. You will get all the benefits of Calacatta as well as the advantages of Porcelain too – win-win! While Calacata Porcelain has been designed and manufactured to have the appearance of Calacatta Marble, it will be slightly different butdepending on what you are looking for, it could be either a great or bad thing. Calacatta Porcelain will be uniformed in appearance as it has been man made and engineered, so do not expect to find your slabs looking unique to each other. While, of course, Calacata Porcelain is superb for those who cannot afford the real deal with Calacatta Marble, it is in no way a direct replacement. Anyone who is looking for Calacatta Marble will spot the differences a mile away, however Porcelain still offers stunning beauty with all the benefits of being waterproof, low maintenance and much more. With Calacata Porcelain, not only are you going to be paying much less but you will also be getting many more benefits too. Your surface will remain waterproof, stain and scratch resistant for its entire lifespan and never needing to be re-sealed or having any treatment whatsoever. Therefore, you will be saving money in the long run as well as with the initial purchase. When it comes to deciding which material you would like for your home renovations, it can be extremely tough narrowing down what you like and dislike. A lot of materials have a very similar list of pros and cons, however the differences between them can cause a huge decision to be made. Whether it is based on which colours are available or how easy the slabs are to keep clean, every reason to choose one material over another is very important. This overview will hopefully be giving you some good information on which material out of either porcelain or quartz is the right one for you. Porcelain comes with a huge list of advantages and not many pitfalls at all. Porcelain is available to be purchased in a massive range of colours and finishes to suit every type of personality or colour theme. Regardless of what colour you are looking for, you are bound to find the perfect colour and finish of porcelain for your home. Porcelain can be made to look like a lot of natural stones such as marble with its veining. So if the natural appearance is what you are after, then porcelain can definitely help you achieve that with minimal cost. If you are looking to have a huge work surface or a kitchen island for example, then you never have to worry about creating your surface out of multiple slabs. Porcelain can be bought in huge slabs to give the perfect look to your room. Porcelain is also brilliant as it will never fade through the sunlight, so you never have to worry about your beautiful slabs fading in the sun. So go ahead and place your porcelain slabs in front of a window in direct sunlight, as it will never make a difference. Porcelain is also perfect for any area where there will be spillages of food, make up or anything that is generally easy to stain. Porcelain is incredibly stain resistant as well as scratch resistant, so you never have to treat your slabs as if they will break by looking at them. However, porcelain does not come without its disadvantages. Porcelain can crack, chip and damage over time if you are not careful enough, however the risk of this damage occurring is much less than natural stone. But still, the risk is high enough for you to have to worry about being careful and taking proper care of your slabs. Quartz is very much a good contender for being used within home renovations due to its amazing list of benefits. Quartz is known for being very low maintenance which is a dream for potential customers. Unlike natural stones, Quartz will never have to be treated or re-sealed during its lifetime, making it so easy to maintain. Quartz is a non-porous material which means that cleaning is made easy. Just like porcelain, quartz is also stain resistant. So you never have to worry about spilling drinks, making a mess with food or upending make up by accident – as it will simply stay on the surface top waiting to be cleaned off. Quartz is also such a budget friendly option. Not only is it great for the initial purchase but long term costs are non-existent because it requires no maintenance at all. Even if Quartz was a bit more expensive to purchase, it would be worth the investment due to the zero maintenance you are getting. Lastly, quartz is incredibly hard wearing so it is perfect for work surfaces and flooring. It can withstand high volumes of traffic without problems and should last you a life time as long as you take proper care of it. Porcelain is such a popular material which is growing in popularity every day. Porcelain started off as a ‘different’ solution to your home renovations but it is now an option in its own right. Check out here our range of porcelain slabs for wholesale. Hopefully this overview of porcelain tiles and what they can offer you and your home will give you an idea of what it can offer you. Porcelain has such a lengthy list of advantages ready to help you decide on your material of choice. When you start shopping around for porcelain tiles, you will soon realise that the option you have for colours is huge. You will never feel like you are having to negotiate the appearance of your home by choosing a slightly different colour or shade than what you originally wanted. Whatever colour you are looking for, you can be sure to find it available. A big benefit of having porcelain slabs within your home is that they will never fade as a result of being placed in direct sunlight. Sunlight will not have any affect on your porcelain slabs at all, so you can be sure that wherever you decide to place them that they will last the same amount of time throughout the house. Porcelain slabs are perfect for kitchens and bathrooms in particular due to its stain resistant ability. Whether you spill food or drink that is known to stain such as wine, it will never stain your porcelain tiles as long as it is cleaned up straight away. Porcelain will never soak up any spillages, instead it will remain on top of the surface ready to be simply wiped away, keeping your home looking cleaning and tidy. Similarly, to being stain resistant, porcelain being scratch resistant makes it perfect for areas such as kitchens, bathrooms or dressing rooms where there will be items such as knives or heavy objects that are capable of scratching surfaces. Your porcelain tiles will hold up against most sharp and heavy objects. After you have picked out which colour you would like your porcelain tiles to be in, do not forget to check out how many different patterns are available. Thanks to porcelain having varied pigmentation, it creates a huge range of patterns from veining to freckles. So if you are looking for the appearance of a natural stone like marble, then porcelain can give you just that but for a fraction of the price. When you are wanting your porcelain tiles to be large or small, it will not be a problem. Porcelain is available in a range of sizes to choose from, so regardless of the appearance you are wanting to achieve with your tiles, you will be able to. For example, if you are wanting a kitchen island but to use one single piece of porcelain, this will not be a problem at all. Likewise, if you would prefer to use smaller pieces then you simply place your order for that size. Both customers and manufacturers love porcelain as it is perfect for handling, preparing and cutting. For all stages of production from cutting to preparing for installation, porcelain can be handled very easily which makes for a very quick process from start to finish. Your porcelain tiles are perfect for any area within the home as it is incredibly waterproof as a material. So whether you are likely to be spilling water or liquids within the kitchen, walking in water from the rain into your hallway or spraying water in the bathroom, it will never be a problem as the material is entirely waterproof. Water will simply remain on the surface of the material ready for when you are there to wipe it all away. We have mentioned before that porcelain is perfect for both kitchens and bathrooms and again, here is another reason why. Whether you are placing hot pots and pans on the surface or placing down hot hair straighteners, you do not have to worry about damaging the surface as it is heat resistant. However, we do still recommend that our customers continue to use their normal precautions such as heat pads to minimise the risk of damage. Porcelain is known for being very durable and hard wearing, which makes it perfect for placing in high traffic areas such as kitchens or hallways. No matter how many times porcelain tiles are trodden on or slammed down on, as long as you take proper care of the material then it will last you for many years to come. Porcelain has been recently growing in popularity for being used for home renovations. Porcelain comes with a long list of pros and very little cons, however so does Quartz! Is there a huge difference between the two materials? Hopefully this article will cover why Porcelain and Quartz are both brilliant but where their downfalls are also, to help you make the decision about which material to use for your home. Porcelain is one of the best materials you can go for if you are wanting to be able to choose from a wide selection of colours, patterns and finishes. But what creates such a big selection to choose from? The raw materials within porcelain have varied pigmentation, to give you a lot to choose between. When it comes to the finishes, you are even able to choose a finish that has veining like marble. Furthermore, once you have taken your time in carefully selecting the colour and finish, you will be glad to hear that the appearance will never fade as porcelain is UV resistant. Whether you place it directly in sunlight or not, it will have no affect on the long-term appearance of your worktop. Porcelain is also completely stain resistant, which is perfect for any worktop regardless of whether it will be in the kitchen or bathroom. These two areas tend to have a lot of spillages from a range of chemicals, food, drinks and more. You will have peace of mind with your porcelain worktop as it is so easy to keep clean. 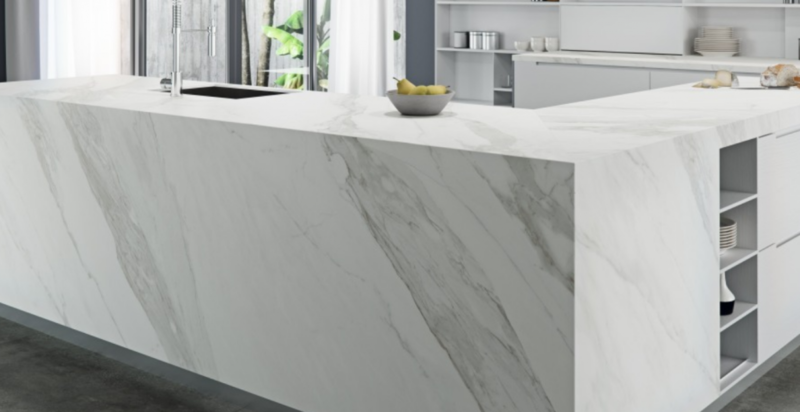 If that is not enough, porcelain is also scratch resistant which means that you will not have to worry about accidentally damaging your worktop with a slip of the knife! With porcelain, it also comes in large slab sizes too, unlike many other materials out there on the market. You will have the ability and flexibility to use one single slab for your kitchen, offering a stunning look. You will not need to have multiple slabs fused together, depending on the size you are looking for. You will also benefit from porcelain being so easy to handle, as well as the manufacturer! When it comes to the time of installation and preparing the area, the porcelain worktop can be handled and cut with ease which makes it a quicker process for everyone. However, porcelain is not without its cons either. Porcelain comes with so many advantages, but the one downfall is that it can be chipped, cracked or damaged. Even though it is scratch resistant, this does not make it unbreakable. So you will still need to be aware that heavy items or force can still damage your worktop. Much like porcelain, quartz is such a great contender for being used for worktops around the home. Quartz has to be one of the most popular materials out there to use and there are so many reasons why! Quartz is highly known for being low maintenance, which is a huge bonus for most customers who are looking to renovate their home. 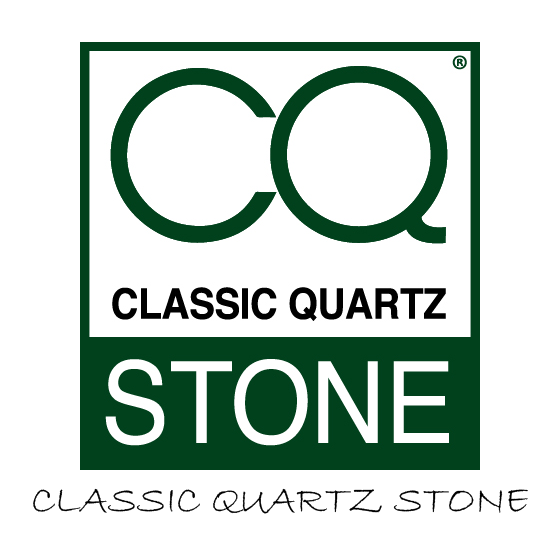 Unlike natural stones, Quartz will never need any treatment or sealing during its entire lifetime, meaning no extra costs or hassle for the homeowner. As Quartz is also a non-porous material, it also makes it extremely easy to keep clean. Quartz will never harbour or soak up any spillages, instead it will simply stay on top of the surface for when you wipe it away. Quartz is also scratch resistant, much like Porcelain, which means that sharp objects are not a huge problem. But obviously you still need to take the normal precautions to minimise the potential for damage occurring. Lastly, Quartz is also very hard-wearing so it is perfect for high traffic rooms in the home. However, much like Porcelain, it is not without its cons either. Quartz may comes in a huge range of colours but it cannot replace the beauty of other natural stones like Marble. 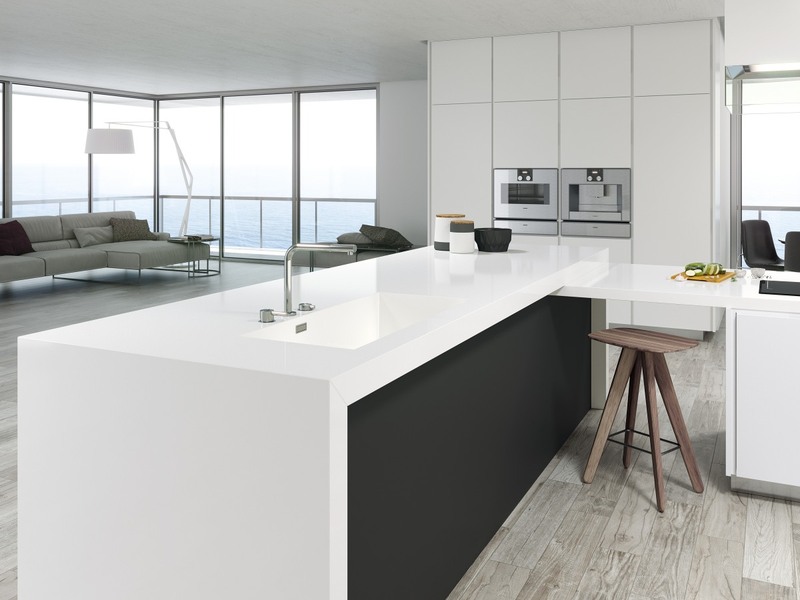 Simply, there is no replacement, but Quartz is a brilliant alternative. How to Clean and Maintain Porcelain Worktops? To a lot of people Porcelain worktops is a new idea but for many it is a material that is very on trend at the moment. Porcelain is the material of choice when it comes to bathroom renovations and it is upcoming for the kitchen area too. Within the UK, there is a high demand for Porcelain worktops and this demand is due to its long list of pros. But what is Porcelain? Porcelain is a manufactured material and it is a type of clay that is heavy in kaolinite, which is a mineral. Clay that is rich in kaolinite is also called ‘China Clay’ which provides you with another insight into the quality and appearance. Check out here our full range of porcelain slabs colours. When it comes to keeping your Porcelain worktops clean, it could not be easier. When Porcelain is being made it is given a glaze which protects the surface, this also acts as a waterproof barrier. Now that it is waterproof it is extremely easy to keep clean as you do not have to worry about spillages causing problems or what products you can use. All you need to keep your Porcelain worktops clean is warm water, clean cloth and mild soap. This is all you need to maintain a hygienic and clean surface for your food preparations or cleaning regime, depending on the location of the worktops. If you happen to use any harsh chemicals such as bleach or ammonia, then there will be no need to worry as these chemicals will not likely cause any problems. Hopefully now that you have read our simple guide to how to keep your porcelain worktops clean, you now have all of the information you need to feel comfortable that you are able to care and maintain your new porcelain worktops.